battle royal determined teams and seeding. 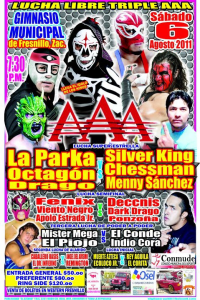 Hijo del Solitario, Monster Clown, and Murder Clown were all announced and did not appear. Nosawa, Jaque Mate and Silver Kain took their places. 10 man match. Everyone had to figure four seven minutes before eliminations. 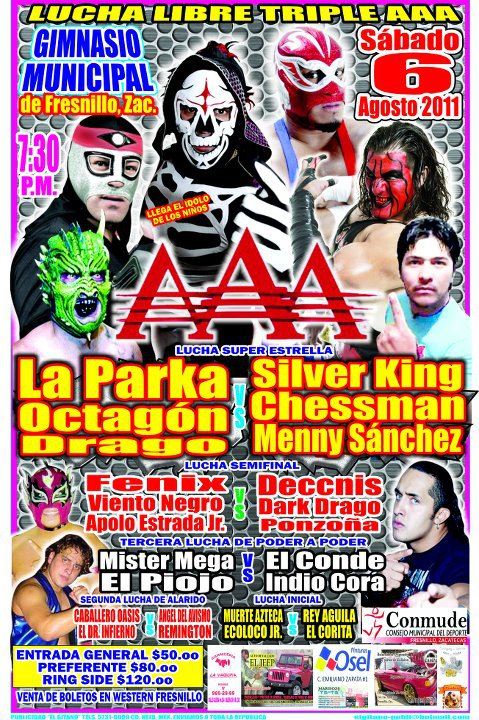 Order of eliminations: Oriental, Anibal, Solar, Dos Caras, Octagon, Chessman, Silver Kain, Axxel. Zorro and Scorpio had a single fall match for the title, Zorro accidentally hit the ref, Scorpio snuck in a foul. Tinibelas Sr. was angry with the way Scorpio won, and they seem to be setting up a title match. La Parka refused to participate at times, and attacked his partners at other times (even working with LA Park.) Electroshock, who had no problem being a rudo, fouled Tinieblas for the apparent win, but Wagner & Mesias made the save. Tinieblas fouled Electroshock back to get the win. Event Notes: Lola Gonzalez was honored before the show. Rudos took 1/3. rudos used fouled to win. Konnan and Black Abyss were with the rudos. Drago wrestled despite the bad arm injury. Tecnicos took 1/3. 2) Argho & Danger vs Maniaco Crazy & Obituary Jr.
Rudos fouled the tecnicos, Piero started to count but rethought, rudos argued with him, Piero shoved them, tecnicos cradled them for three. 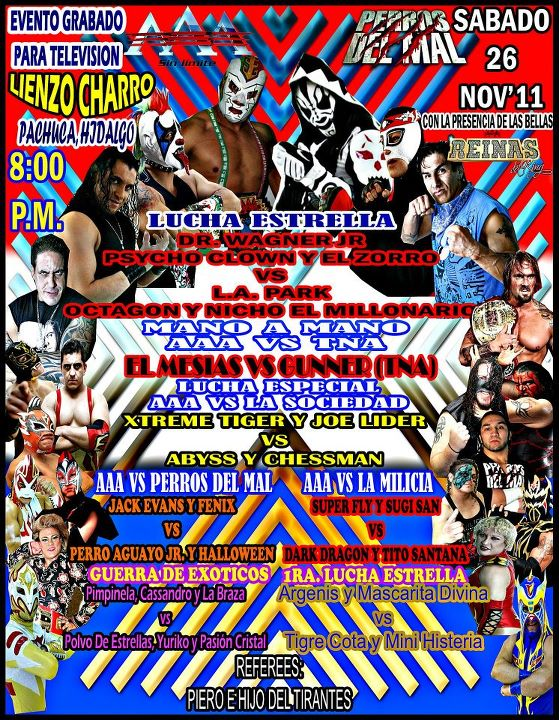 1) Furia Metálica & Rey Carnero b Estrella de Oro & Golden Star Jr.